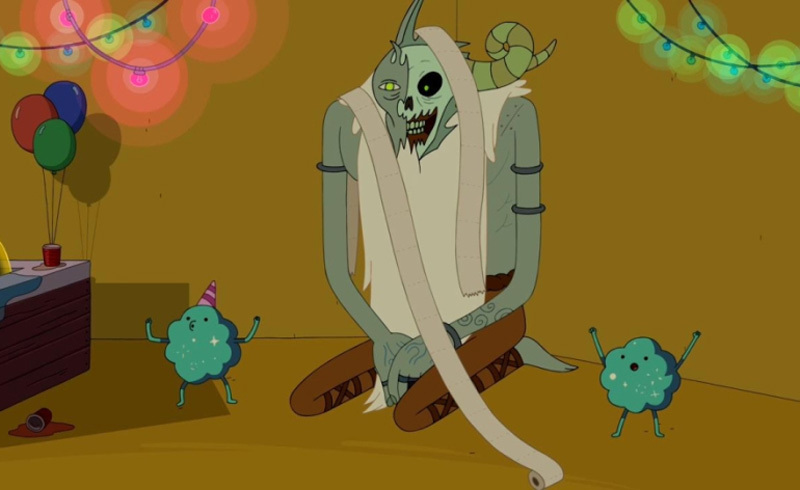 Is there a better way to start a season than throwing toilet paper at the Lich? I think not! Prismo the Wishmaster is having a house party and we’re invited. As I said, the Lich is there; still wearing Billy’s skin, but quiet as a mouse. Turns out that time is weird at Prismo’s pad so he can’t kill anyone. 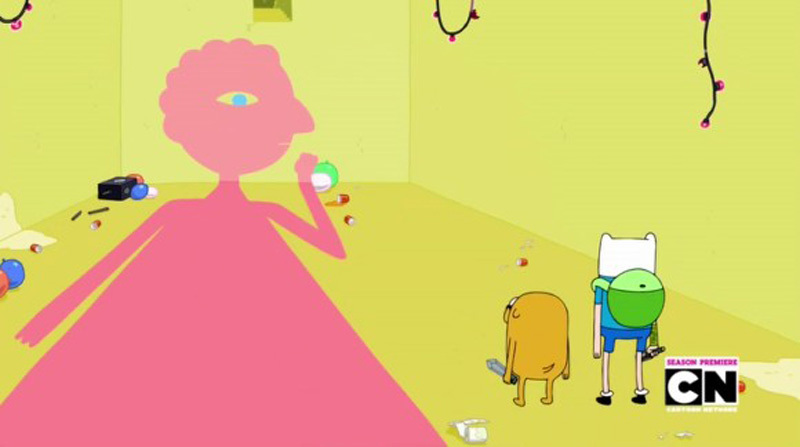 Jake leaves the party and Finn let’s him know that his human father is still alive. It’s a whole thing. I won’t get into it all. Anyway, Finn and Jake now have a quest; to journey to The Citadel and find Finn’s father. A bit on the Citadel, it’s a giant prison planet and the only way to get there is to commit a cosmic crime. Prismo explains all this to our heroes and gives them a task to complete. Find a sleeping old man, do NOT wake him up, and bring him back to Prismo. The dialogue during all of this has just the right blend of “Gee, Gang” silliness from Scooby-Doo and the audio veritas from Dr. Katz. Adventure Time has its own language. It is easily one of the best scripted shows on TV. 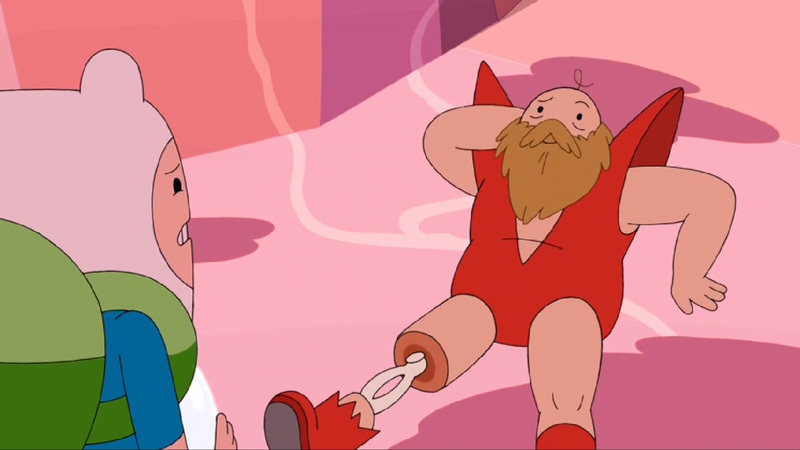 Things proceed quickly as Finn and Jake get to the sleeping old man, fight some smoky weirdness that comes from his mouth (which looks suspiciously like an evil Prismo) and haul him back to the party. Prismo explains that the sleeping man is actually dreaming Prismo into being and waking him up will destroy the Wishmaster, thereby committing a cosmic crime which will gain them entry to the Citadel. Pretty existential stuff for a Monday afternoon. Isn’t that why we love it, though? Big concepts. Big action. Layers and layers of meaning all wrapped up in an animated package. They aren’t afraid to show darkness and face evil head-on; personified in this episode by the Lich. The Lich seizes Old Man Prismo, breathes ashy death, and completely destroys the Wishmaster. 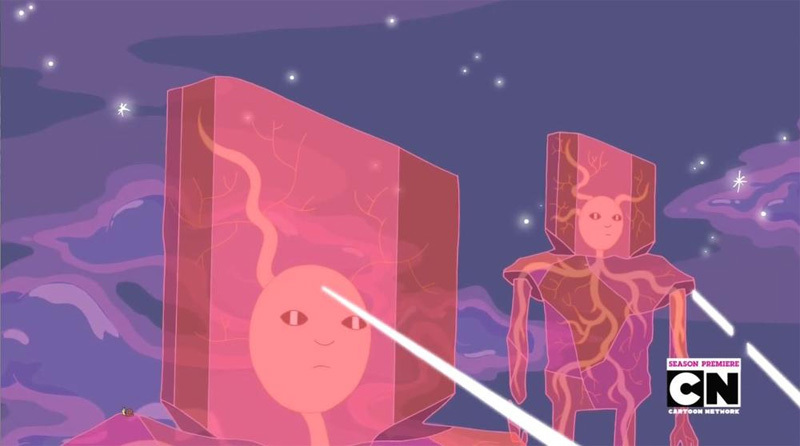 Giant cosmic guardians that would make Jack Kirby proud imprison the Lich and drag him through a portal to the Citadel with Jake and Finn in tow. This scene was truly disturbing. Bravo! Finn finds his father and our hearts break for him. He’s a criminal. A Cosmic Criminal, imprisoned in a crystal. 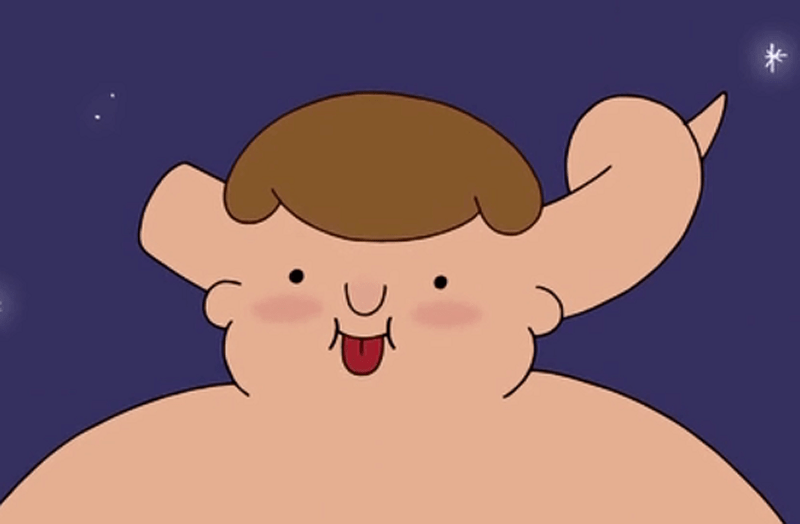 The good news is he’s voiced by Stephen Root. When isn’t he perfect? It doesn’t take long for the Lich to escape and begin turning the Citadel to ruin. Criminals are loosed from their crystals and a mighty, mighty battle begins. The Lich’s evil infests the criminals and he now has a posse of destruction. While all that plays out, Finn and Dad have their first conversation and it isn’t pretty. His father is a self-absorbed SoB more concerned with getting off the Citadel than meeting his son. Their back and forth is particularly entertaining after Martin’s (yes, Finn’s dad is named Martin) leg is de-meated by a stray beam from a dying Cosmic Guardian. Featuring that beautiful language again, Martin asks for some Guardian blood because, “It has that good nootch that keeps us young in the crystal.” Finn retrieves the light blue goop and fixes Martin’s leg just as the Lich rears his head. The character design, animation and Ron Perlman’s voice blend perfectly and create a truly menacing Lich. I don’t think he’s ever been so frightening. A portal opens and Lich’s army makes its way out. Finn strikes out, covered in Guardian blood and the Lich is defeated. More on that in a moment. 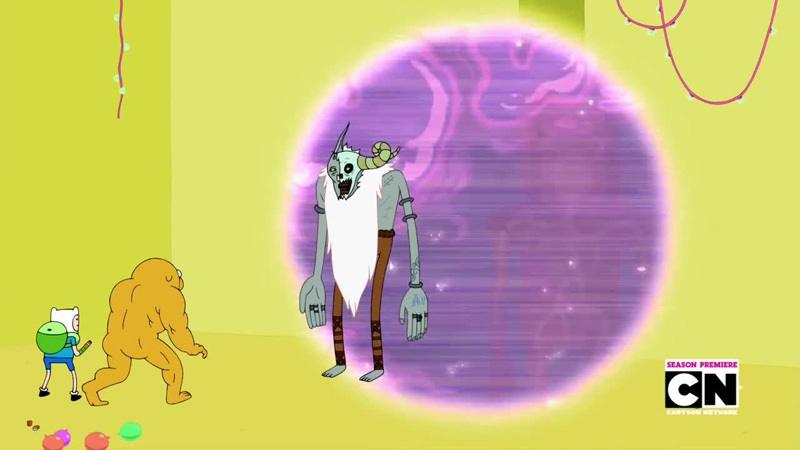 Finn’s father has taken charge and is escaping with Lich’s horde. Jake’s attempt to keep him around is just gut-wrenching and painful to watch. It’s a good pain, though. We’re with Finn, he’s our friend and we want closure for him. Too bad he doesn’t get it. Oh, the Lich is now a giant, harmless baby. Mr. Pig and Tree Trunks are going to raise him. Adventure Time 6.01-02 "Wake Up / Escape From the Citadel"